It’s a common decision teachers have to make as to whether there is a value in setting up a situation where students work things out for themselves rather than being told something directly. This isn’t about ‘discovery learning’ vs ‘direct instruction’ – which is a more fundamental difference relating to a whole approach. It’s simply about when to set up problems that students can solve in order to help them make sense of some concepts themselves, rather than walking them through it in advance. Maths investigations are a great example of this. Finding the sum of n numbers. What’s the general rule? It would be possible to simply tell students that the sum of a series of integers is n(n+1)/2 but, as the figure above shows, it’s a good challenge to set this up so that they can work this out themselves, generalising from the pattern they observe. The same applies to all manner of mathematical theorems and identities. Of course, it can save time to simply tell students the rule for them to practise afterwards. However, in the mix of a series of lessons, it’s great to throw in some of these. I’ve seen teachers deliver great lessons where students have arrived at a general solution for the factor theorem or interior angles in a polygon through a well structured investigation. Leapfrog is a great example of where systematic, logical problem solving can be practised in a new context. First you need to work out how to solve the problem; then you can start to work out how the pattern of moves links to the number of frogs. Have a go! Leapfrog challenge. Click here to try. There’s a lot to be gained from learning to be systematic rather than using a scatter-gun trial and error process. (See below for the answer) It’s immensely rewarding to apply reasoning to other areas of learning. In MFL lessons at KEGS, the concept of ‘Grammar Detectives’ arises fairly often. This is described amongst the many great strategies highlighted in this post and related Learning Lessons publications. The strategy is to set out a set of grammatical changes – or even for students to find them using translation software – and then to ask them to work out the general rule and any exceptions. What’s the grammar rule? What’s the exception? As you can see, a few examples of using plurals in French gives an idea of the general pattern of associated agreements that are needed. This can be applied to verb endings in different tenses too. If students get a chance to play around with this for a while, following the guidance given, then they’ll have a better feel for the changes that are discussed in the topic. They may even come up with some general rules. The site this comes from is http://www.shodor.org/interactivate/activities/ It’s quite astonishing. There’s also great value in having complex problems to solve using the basic knowledge we’ve shared, so students have to interpret multiple variables and make judgements. Annoyingly, I often find that text books run out of steam with the questions they contain. There’s often too much straight recall and bland data extraction. Too often the questions are too straight-forward. However, there are good sources of questions and problems that offer greater challenge – and engagement. Tsumani simulation for A level geography. The game gives you a fixed time to get various strategies in place to save lifes before the tsunami hits and you find out how successful you were. Science Experiments can be turned into problem solving situations in all kinds of ways. A good method is to determine the outcome and then ask students to work back to create the conditions required. For example, instead of exploring the time taken for a reaction between sodium thiosulphate and hydrochloric acid, students can be asked to adjust the concentrations of the reactants so that the cloudiness obscures a marker after exactly 28 seconds. They can be asked to identify mystery substances by applying a range of tests or to work out the contents of a black box of electronics by seeing what happens to the outputs when the inputs change. There are lots of real-life situations with data presented in a way that makes the basic concepts come alive in a challenging manner, through problem solving and evaluation. 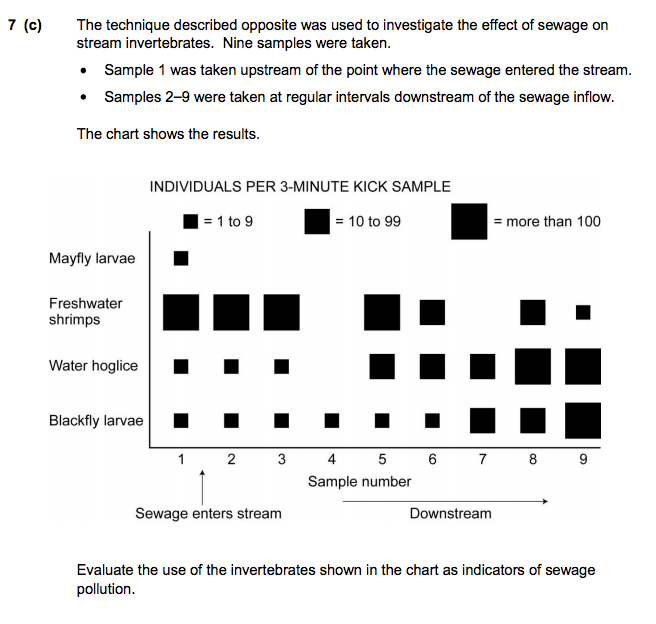 Here is a typical example that relates to the topic of water pollution and the use of indicator species as tool for measuring it. It goes far beyond a simple exposition of the existence of indicator species. This is quite subtle; there are gaps and inconsistencies alongside the more obvious patterns. Question banks for SATS and past-papers are excellent sources of good questions like this; usually far better than what is in text books – as far as I am concerned. The PhET site is a treasure trove of simulations. These can be used badly if they are just used to tinker with. If a tight problem is posed for students to solve using the simulation, then the learning outcomes are great. For example, with radioactivity, students can work out the ages of various artefacts by identifying the most appropriate detector and source, using the data generated. With the many maths simulators of graph functions, students can identify all kinds of patterns or solve a range of problems by constructing appropriate functions and looking for intercepts. The test was complete. John while Dave had had had had had had had had had had had the teachers approval. The point here is that, if students regard these things as puzzles rather than tests, they approach them with a different spirit. I’ve seen a teacher turn a dreary exercise into something else: ‘Spot 10 mistakes in this paragraph’ GO!… A bit of routine bookwork became a problem-solving challenge. 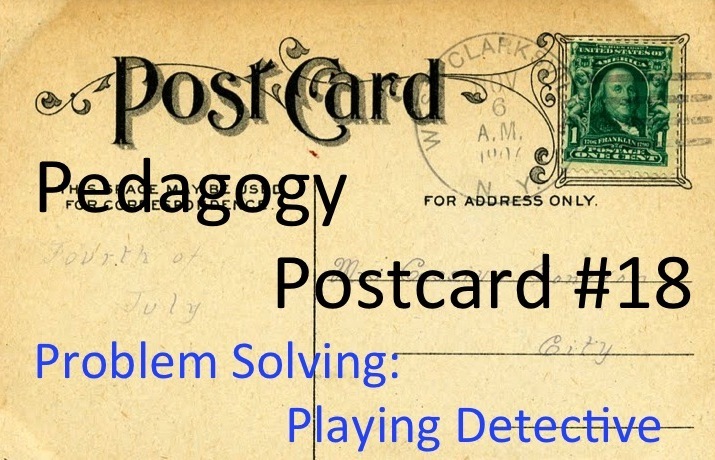 In conclusion – the overall theme of this post is that, as part of the diet of high challenge and engagement, problem solving and detective work have a significant role to play. It’s worth collecting or generating the resources that help you do this because you’re likely to use them again and again. I’m always questioning myself: have I given students a real work-out, applying knowledge or working things out for themselves or have I just got back what I dished out? Usually the quality of the resources is the determining factor.